Manorama News Announced Best 5 M.P’s Of Kerala. The Channel Conducted a Program Named ” 20il Ethra ” To Find Them. The Winners Of 20il Ethra are The Following. A Sambathu , MB Rajesh , P.K Biju are Belongs to CPM (Communist Party Of India Marxist). M.K Rahavan are P.T Thomas From Indian National Congress. A Sambathu Is The M.P Of Attingal Constituency. Sambathu is Again Contesting from Attingal This Year Again. P.T Thomas Is The Idukki M.P, But Congress is not given Ticket to him. MB Rajesh is The M.P Of Palakkadu, He is Contesting from the Same seat This Year. 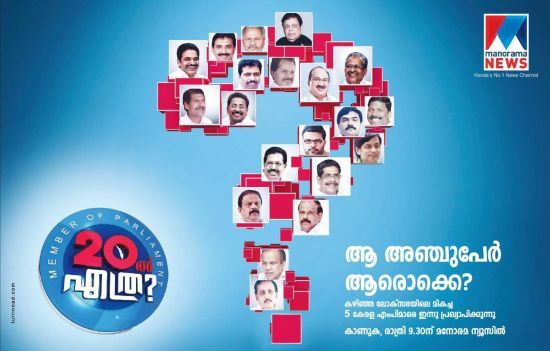 P.K Biju is The Alathoor M.P, M.K Rahavan Is Kozhikkodu M.P. Both These Contesting in This Year from Same Seats.